Historic monuments are passed down through centuries from one generation to the next. 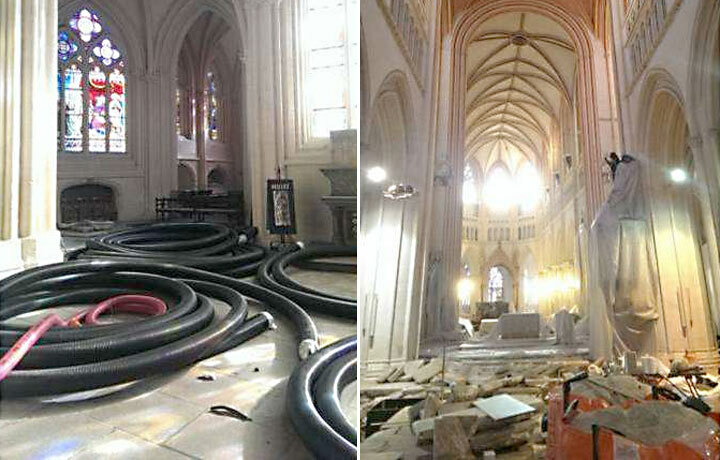 In 2014, the corroded steel floor heating system of the majestic gothic Saint-Corentin Cathedral in north-west France was renovated with the Flexalen polybutene-1 piping system to secure the comfort and warmth of the congregation and visitors. Historic monuments are passed down through centuries from one generation to the next. It’s our job to preserve them in the best possible state. At the same time, we also want to equip them with modern, high quality comfort to preserve their utility. In 2014, the heating system of the majestic gothic Saint-Corentin Cathedral in north-west France was heavily deteriorated. The Finistère regional service for architecture and heritage took up the challenge of renovating the Cathedral's heat supply to secure the comfort and warmth of the congregation and visitors. The only problem: The corroded steel network was covered by 170 m² of flagstones weighing 1.2 tons each. Great durability and resistance to corrosion phenomena are the two essential technical criteria which led us to recommend that Flexalen should be used. Today, it is unusual for heating systems in cathedrals or historic monuments to be installed under the ground. But in Quimper, a system of under-floor steel pipes had been installed in the cathedral in 1968. But in 2014, the network had clearly reached the end of its lifecycle as it was significantly corroded, giving rise to serious leaks and energy losses, a problem made worse by the weight of the heavy flagstones. A quick and effective renovation was vital. Faced with this significant challenge, Mr. Pierre Alexandre, curator of Quimper Cathedral, and a French architect split the project into two sections: heating and paving. 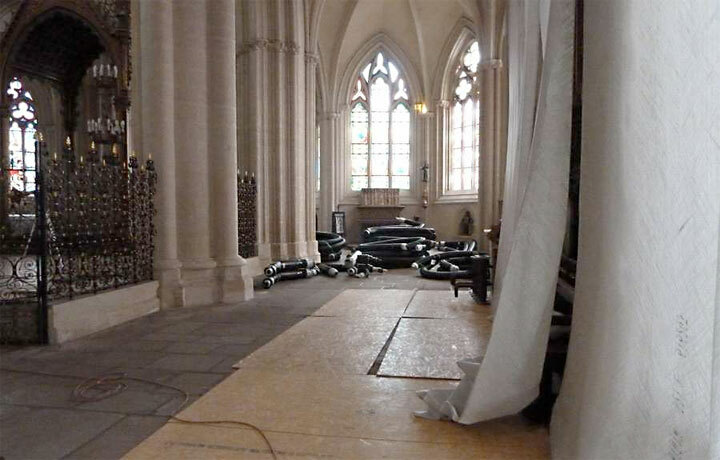 A.R.T (Armoricaine de Restauration et de Travaux) was selected by public tender to carry out the paving work, including the excavation of the floor of the cathedral and the removal of the gigantic dressed stones. For the heating section, it was important to secure expert service for the design of the delicate project to ensure the best possible solution. The design consultants Bâtiments et Techniques, appointed by the heritage service, recommended a solution based on Flexalen technology incorporating an insulated polybutylene piping system. The Flexalen PB-1 piping system is manufactured by PBPSA member Thermaflex. Its ease and speed of installation, minimal use of space – allowed by its flexibility – and durable efficiency proved an ideal match for that challenge. 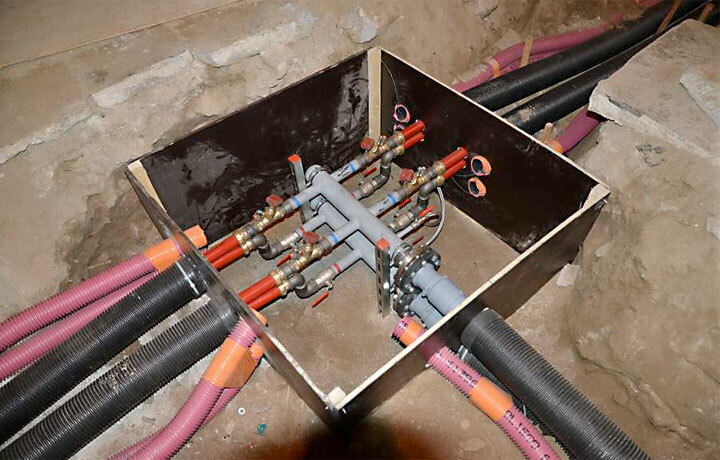 For the installation, Prothermic, a local heating engineer that is well known for its experience in pre-insulated pipeworks, assembled a hand-picked team for the challenging project. Bâtiments et Techniques had already worked with Flexalen in former projects and were already convinced of its advanced flexibility. Indeed, to avoid digging deeper than the original trenches and in order to manage the work in confined spaces, this was an essential asset. Furthermore Prothermic, who carried out the installation works of the heating system, successfully preserved the deeper archaeological remains thanks to the shallower trench required for Flexalen pipes made from PB-1. Prothermic also succeeded in collaborating with the paving business A.R.T. ; due to Flexalen's flexibility and ease of welding, less workspace was needed compared to other technical solutions. Prothermic and A.R.T. could therefore establish manholes together where necessary, minimizing the spreading of dust – key to the protection of the cathedral's interior. Digging up the floor of a historic monument is a complicated task. The permissions and precautions necessary are more time-consuming and expensive than in ordinary buildings. The dust produced by the excavation for example, could easily spoil the costly and meticulous renovation. For these reasons, a headache-free distribution system was imperative. The longer the lifetime and performance of the system, the better for the conservation of the building, ensuring minimal financial and environmental cost in the future. The entire pipe network needed to be sustainably replaced with the least possible disruption, especially considering that historic monuments are grounded by archaeological sub-soils which are crucial for its conservation. Have you ever felt disappointed on finding a church or a museum which you had planned to visit closed for renovation? This is exactly the kind of disappointment the Finistère regional service for architecture and heritage in Quimper wanted to avoid. So the timeframe for the renewal of the heating system was clear – but narrow: the entire operation needed to take place between September 1st, at the end of the peak holiday season, and December 13th, the famous feast of Saint Corentin, patron saint of Quimper Cathedral. The realization and implementation of the polybutene heating network went exceptionally smoothly thanks to the optimized network design by Thermaflex and the fast installation by Prothermic. The cathedral is now equipped with a modern and efficient heating system under 170m² of 1.2 ton flagstones. The extraordinary cooperation with A.R.T, Prothermic and Bâtiments et Techniques kept the project well within the 3.5 month window, while the objectives of the Finistère regional service for architecture and heritage are fully covered. 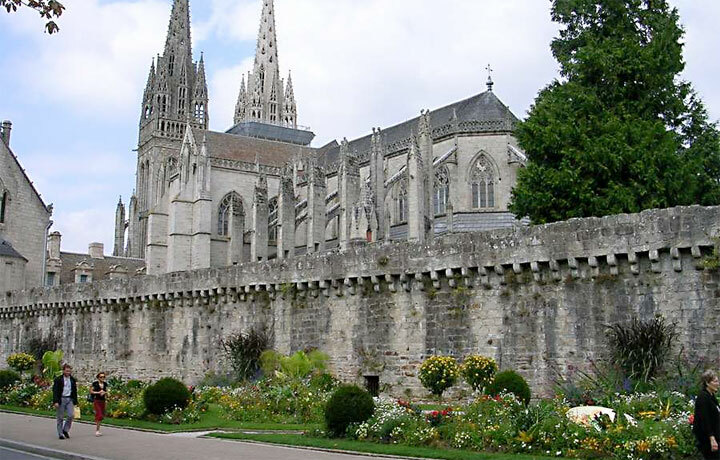 The Quimper Cathedral can now warmly welcome the congregation and visitors for generations to come.